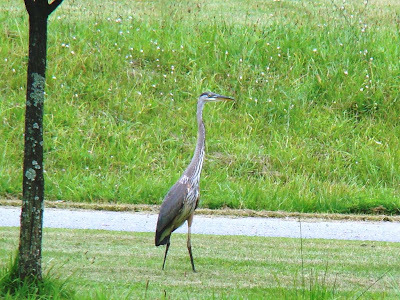 Great Blue Herons are a regular visitor to Roundtop’s ponds. I can’t call them common visitors, though sometimes that is true, and it can also be true in certain months. Sometimes I think one adds Roundtop to its regular route and shows up daily for a few months. Sometimes that doesn’t happen, and I don’t see them for several months. This year I’ve only seen them a time or two. This one showed up for the first time last evening, so it’s too soon to know if this one will become a regular visitor or just a one-time occurrence. These birds look especially big and clunky when they are standing out on dry land, which doesn’t happen all that often. Usually they are up to their knees in water, skulking around cattails or other tall reeds. They look clunky enough even then, but that’s nothing compared to how they look out of the water. The birds are at least 3 feet tall, often 4 feet tall, and have a 5-6ft. wingspan. Despite their huge size, like most birds they don’t weigh much—under 5 lbs. They are pretty wary birds, and I’ve found it rare to get very close to them. Typically, they give a loud croak and fly off at the first sign of something near them. I was in the car when I took this photo, which helped a bit, though this bird didn’t hang around very long even so. Even a brief visit adds a bit of drama to the day. Something this large brings its own drama even if it doesn't do much. This morning, a little mini-crow drama took place in front of the cabin. Crows are, among many other things, drama queens. Like my Baby Dog, their self-appointed task is to announce to the world anything that seems to them to be Out of Place or Wrong. In and of itself, this isn’t a bad thing, but the way they carry out this task leaves something to be desired, at least by human standards. The problem is that minor infractions of the forest are capital offenses in their eyes. In human terms, crows would sentence a trespasser or a jay-walker to death. They over-react. And so, they become a bit like the boy who cried wolf. After a while, they are simply ignored, which I imagine only heightens their outrage. So this morning, when I heard one of the local crows fussing, I paid no attention. In a bit, crow #1 was joined by crow #2 and then crow #3. Eventually, I don’t know how many crows showed up, but there was no shortage. By now I suspected that juvenile Red-tailed Hawk, who is a favorite target, or perhaps one of the Great Horned Owls was nearby. So I went to investigate. I didn’t see anything. The crows continued to fuss and scold. And then I saw him. The neighbor’s cat, an old, fat and neutered male that I believe is at least slightly deaf, was stretched out and asleep underneath some undergrowth, apparently having missed his owner’s evening call to return inside. The crows were outraged. The cat was asleep (at first I thought it was dead) and unaware of the excitement it was causing. Eventually the cat heard me approach and woke up, blinking and stretching. The crows followed him all the way home. The cat ignored them. This cat hasn’t hunted in years, if at all. The crows didn’t care about that. As far as they were concerned the cat was as dangerous as a hunting and healthy bobcat. I could hear them following the cat as it headed back up the hill to its house and breakfast. 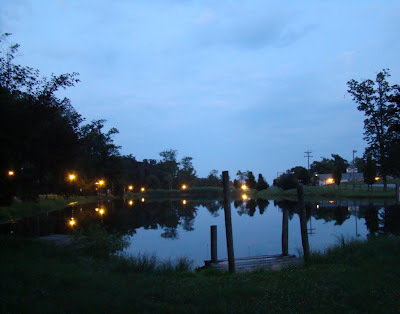 Rain, thunderstorms, heat and humidity hold Roundtop in its grasp this week. Rain is a daily event, though it certainly isn’t needed anymore. Storms pass somewhere nearby daily. I hear thunder every night but haven’t yet gotten a storm directly overhead. The weather has cramped my outdoor activities a bit. I don’t want to be in the middle of a project or on a long walk only to find myself in the middle of a thunderstorm with no escape to shelter quickly available. So I end up not getting as much done as I’d like or walking as far as usual. Inside, I’ve been forced to pull the fan out of storage. I haven’t yet turned it on, though I expect I’ll have to do that this evening. 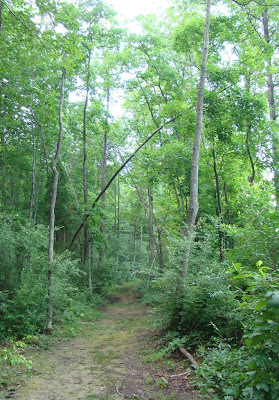 The forest is like a jungle, and sticky mud makes walking in many areas less than enjoyable. I’m starting to think we might make rain forest status here this year, though as thick as the forest looks right now, I’m not sure that would make any real difference. Unless a few toucans or monkeys show up. Perception is a funny thing. 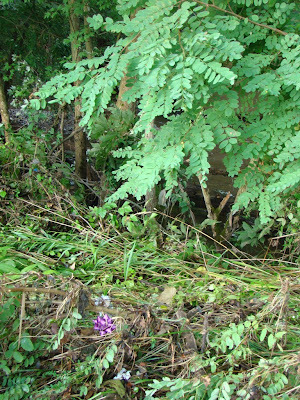 This morning I came across this purple bow, sitting amongst some vines and thought how pretty and unexpected it looked. I wondered how it got there and where it came from. It was just a little fun surprise along the edge of the woods. And then it occurred to me that if the bow had been, say, a beer bottle instead, my reaction to it would have been much different. I would likely have grumbled angrily about how rude and inconsiderate some people can be, about how they had no respect for the woods. That imaginary beer bottle would have set my entire day off on the wrong foot. And yet, both the bow and a beer bottle are very much out of place along the woods edge. But somehow, the bow seems like less of an intrusion, less an act of mindless littering. But now, thinking about it, I’m not so sure that’s really the case. Oh, I could argue that a bow will blow away or decompose while a beer bottle is "forever," but the reality is, there’s not that much difference between them, is there? Neither belongs here in this spot. The biggest difference is that one is prettier than the other. And what does that say about me that something pretty seems less rude or less out of place than something that’s not so pretty. I’m going to have to think on that one for a while. Thursday was quite the day here at Roundtop. I spent most of the day leading groups of kids down through the woods, where they caught frogs, avoided a nest of wild bees, nibbled wild berries and looked at various ferns and mushrooms and whatever else I could find that I thought might interest them. The day was overcast, threatening storms through most of it. The humidity was high, and the day felt pretty tropical. I was relieved it wasn’t 90 degrees the way it was last Thursday, though 80 degrees and humid feels hot enough. On the way back to camp on the last hike of the day, I heard the sound of very distant thunder. The kids and I were about halfway back to camp. I kept an ear out for it. I noticed that it didn’t seem to get much closer, though I did hurry the kids along a bit just in case. We made it back without incident, and I got back to the cabin and took a quick shower. The sky was darkening by the minute, and the storm was edging closer. At this point, I already knew that the storm was moving slowly—always a bad sign. When a storm approaches slowly, it means when it finally reaches me, it also takes a long time for it to move away. As humid as the day was, I knew this would likely translate into a lot of rain. And boy, did I get a lot. Nearly 4 inches of rain fell in an hour. I can’t remember the last time it rained that hard for that length of time. Usually downpours that heavy are brief, lasting just a few minutes. Not this time. The official total was 3.76 inches. I can tell you that my 4" rain gauge overflowed, though I hadn’t dumped it from the day before when I had perhaps an inch of rain. And the storm wasn’t just over my cabin. Flash floods were reported in many locations, necessitating many rescues from both cars and homes. Roads were closed. Roads were washed away. I was holed up in the cabin, and didn’t see the reality (except on TV) until this morning. My morning commute was a weaving dodge around sawhorses marking areas where the road was washed away—in some cases feet deep. Brown mud covered the macadam wherever water had raced across low areas. It was a mess. Whew! I just hope that’s done for a while. A storm like that every once in a very long while is more than enough. 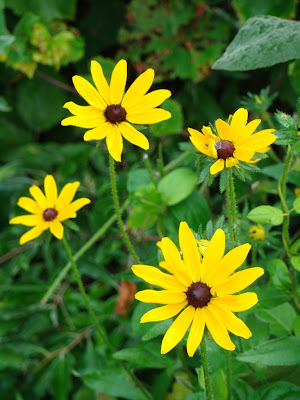 Brown-eyed susans have started their annual show this week here on Roundtop. I think of them as perhaps the showiest of the midsummer wildflowers. In the almost never-ending expanse of green around me, their bright golden shade is a welcome contrast. Last evening, thunderstorms danced all around me but didn’t appear overhead. This morning, the sky is overcast, even a bit foggy. That makes me notice all the more how the sunrise grows ever later, minute by daily minute. I almost turned on my outside porch light this morning until I stopped myself and simply refused to go there yet. This morning’s gloom also meant that the great horned owls were still calling when Dog and I first headed out on our morning walk. The moist air accentuates smells, captures the dogs’ brains and makes them stupid. Like most dogs, Dog and Baby Dog can only do one thing at a time, whatever thing most captures their attention at that second. Dog put his nose to the ground and tried to gallop off, entranced by the scent of deer. Judging by the tracks I see almost daily, the deer are here every night, but that moist air makes their scent stronger and holds it in that spot more than is typical. Baby Dog has a different approach. She points her nose into the ground and would hold it in that same spot for 45 minutes if I didn’t drag her away. You’d think both of them would treat deer smells as old hat by now, considering that they’re in the driveway as often as not. Mid-summer on the mountain is usually a quiet time, but quiet doesn’t mean absolutely nothing happens. Last evening, I heard an odd bird call, a loud one. The loudness of the call told me the bird in question was large, though I’d never heard this particular sound before. By large, I knew that meant this bird was either a hawk or an owl. The weirdness of the call told me the bird was almost certainly a juvenile. I suspected the bird was being harassed or scolded by smaller birds. Juvenile birds make weird noises that often bear little resemblance to how they sound when they are adults. I’ve heard a Red-tailed Hawk with an adult voice trying to make juvenile food calls near a parent bird—and boy, does that sound ridiculous. I’ve heard owls make all kinds noises they aren’t supposed to. Being able to identify a species by its "normal" call doesn’t mean you’ll know every call that bird can make. At one point I saw the silhouette of this bird as it moved from where it was to a spot just behind the cabin. The silhouette confirmed the size of the bird but it was too quick and too shielded by leaves to tell me much more than that. 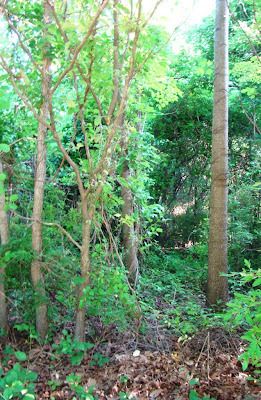 So I went out onto my back deck, which is raised 6-7 feet off the ground and gives me a better view into the forest. After much searching I saw a bit of motion and then I saw it—a juvenile Red-tailed Hawk. The bird was now sitting on an upper limb of an oak tree, settling its ruffled feathers. My girls, the chickens, were eyeing it suspiciously, but the hawk didn’t seem to be paying any attention to them. It preened a bit and rearranged its feathers with some emphasis, all confirming that it was likely being harassed and chased from some smaller bird’s territory. It had that look of being put out. It sat there for a while. I watched it as the darkness deepened. The chickens went back to scratching on the ground. The forest was already dark but light still remained in the western sky by the time the bird lifted its wings and flew deeper into the forest again. I’m almost afraid to even mention the weather this weekend. I’m more superstitious than I’d admit to, I guess. I have this feeling that no sooner will I mention that it is not too hot here that the solar flood gates will open with a vengeance and the temperature will rise into the mid-90’s and turn humid. 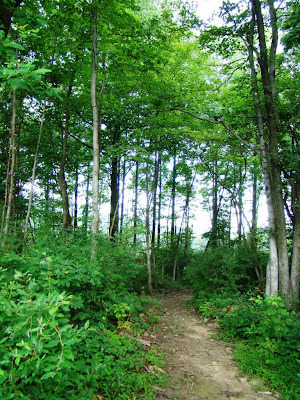 It’s a (very) rare summer in southern Pennsylvania when summer hiking is pleasant. But this year the weather has routinely been nice enough that I can hike in the woods in mid-afternoon and still enjoy the experience. So yesterday Dog and I headed into the woods, on a trail I haven’t walked for a bit. Many of my hikes this summer have been to examine the trail that I take with the camp kids on Thursdays, so I can know what I am likely to see and to identify interesting plants that I don’t already know. But this week, Dog and I took another trail down into the valley. It was a pleasant afternoon. The woods are a bit dry, though not dangerously so. Dog enjoys these walks enormously, sniffing under as many logs as he can. We walk down along a grassy two-track road. The trail isn’t much used, if at all. The grass is nearing knee-high. The breeze kept various biting insects at bay. Our walk was mostly shaded, the leafy canopy too thick to allow in much sunlight. Midsummer, even on an afternoon as pleasant as this one, is not the time when the forest is at its most active, so our walk was a nearly silent one. A few wood thrush sang their fluted call, a towhee questioned our presence, and a single chipmunk darted across the trail as fast as if his tail was on fire. But mostly, the walk was quiet and peaceful, lacking in drama of any kind. That’s what I liked about it. Forays into the woods don’t need drama to be interesting to me. 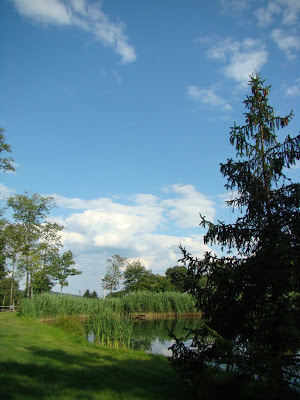 The lack of drama is its own reward, a respite from the bustle of daily life. That alone makes it worthwhile. Thursday is my day out in the woods with kids, trying to get them to take an interest in the outdoors. I walk them along an old woods road and we look for stuff. Midsummer is not an exciting time for this to the kids. They like big and splashy, lots of drama. A hot and humid midsummer day is not an a great prescription for big and splashy. Still, we had some fun. 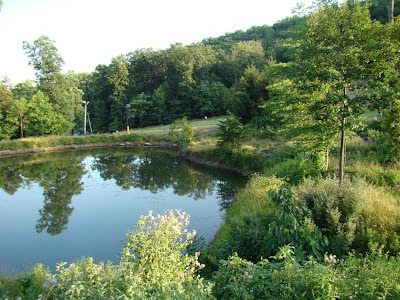 I take several groups of kids 8-15 down the mountain and over to a woodland pond. We found the same poor toad three times. Everyone got to hold it. After three trips the toad was in hiding and nowhere to be found. I don't blame the poor thing. We located some frogs and caught a few of them. We saw some chipmunks and those excited far more excitement than I would have expected a chipmunk to excite. I tried to interest them in ferns and fungus and hickory nuts and things like that. Sometimes it worked. The younger kids are easily amused. The older kids are a tougher audience, at least in part because they are more interested in each other than in anything. The girls giggle over nothing; the boys are in their smart-aleck phase. I enjoy the time with the kids, though I suspect my impact is pretty limited. For some of these kids, many of whom have never gone on a hike in the woods, a week spent outside doing fun things is a first. 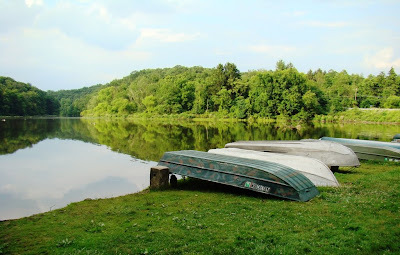 They are learning to fish, kayak, canoe, rappel, the basics of "wilderness survival" and the like. For me, it’s a long day, especially since I am up and down the mountain three times during the day. The total distance is only 6-7 miles, but it’s spread over seven hours of slow walking, which I find more tiring than moving at a normal pace. And, of course, somehow, the hike managed to hit on the first day of the year when it was over 90 degrees and humid. No more of those days are even in the forecast. I'm just "lucky" that way. 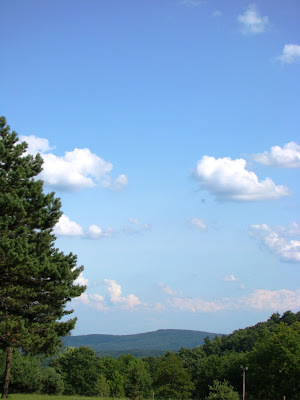 Today’s photo is not from my hike yesterday; it was taken the day before at Roundtop, near the bottom of one of the ski slopes, when the humidity was still low. A brilliantly blue sky might be the only thing bluer than an Eastern bluebird. 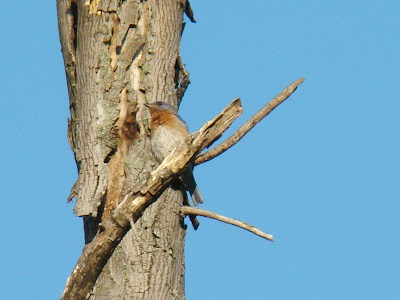 Here on Roundtop, bluebirds may be the most common species found year-round. Chipping sparrows and American robins are more common during summer, but they don’t spend the full year here. Chickadees and tufted titmice are pretty common, too, though they are spread out all over the place, so actual numbers for them are difficult to determine. Bluebirds are both numerous and easy to quantify. They are easily visible as they ply the grassy ski slopes of summer. It’s not uncommon for me to count 20 of them in a single evening just along the mountain’s western slopes. No nesting boxes are found here. The dead or hollow branches these birds like are also numerous, as evidenced by the one in the background of today’s photo. It’s just as well no one has placed nest boxes for them here at Roundtop. There’s already plenty of them, and more might just result in over-crowding. In winter, when the slopes are covered with snow, the birds still remain here, though they can be harder to find then. Often, they join up with other species, sometimes with the few over-wintering robins, to forage in winter flocks. They are quick to find any open water or wet spot, and I may see a dozen or more around the tiniest. I routinely put out fruit for them in winter, but truthfully I’ve never had one show up at my feeders. I think the cabin sits too deep in the woods for them. Near the cabin, but at the bottom of the lane, I often see them in early morning heading out of their roosting tree, where they all seem to sleep. The tree is about 100 yards from the ski slopes, along the power line. Usually, I hear them before I see them. They don’t seem to emerge all at once, though they usually leave within a few minutes of each other. Then they head back to the slopes again, commuting, as it were, back to the grass and then returning each night to their sleeping tree. This summer the weather here has been amazing. If all summers were like this, I’d like them a whole lot better. So far not one day has reached 90, let alone topped that figure. Best of all, the humidity remains low, with only a few forays into that higher, more uncomfortable realm. The nights dip into the upper 50’s by morning, and I’ve needed that fleece throw by 2 a.m. on most nights. I’m spoiled, I know, and I keep telling myself not to get used to it because August or 2010 will certainly not be like this. And in case you haven’t yet heard, the El Nino effect is getting underway again, which is likely to affect the northeast U.S. this year or next. In my area, El Nino tends to make the winters warmer and wetter than average, a bad combination for skiers and winter sports enthusiasts like me. Still, that’s in the future, maybe, and I won’t let that diminish my enjoyment of the weather today. Glories like this can’t be expected to last forever. 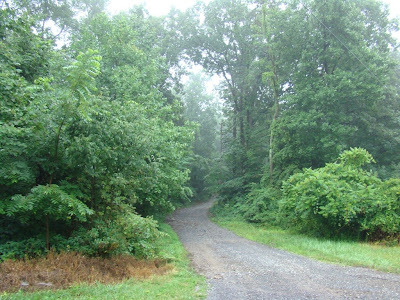 Roundtop’s woods were quiet this weekend. I didn’t see any life-and-death dramas, find any rare birds or see anything unusual. That means it’s mid-summer, that nearly-static time of the year where nothing much happens. The black raspberries are over, a few leaves on the poison ivy are already turning red, the great-horned owl still calls from deep in the forest. The promised storms brought a few sprinkles of rain but no major downpours. The sound of thunder slid past to the north, the storm never reaching the cabin. Quiet on the mountain seems to be the rule of the day. Or perhaps the week. I tell myself to enjoy the lull, to appreciate the quiet, but I’m finding it hard to do. I don’t think I’m geared for quiet. I have trouble getting past the idea that now is simply boring. I know the quiet won’t last, and I also know that at some point I will long for quiet but for some reason that doesn’t help me now. The forest itself doesn’t mind the quiet. The oaks don’t long for wind or storms or change. The forest residents take the quiet moments as they come. Perhaps, in some future year, I too will learn this skill, this ability to accept the day for what it is. It’s a lesson I am still working on. Friday’s flower is a native species—one with many names. 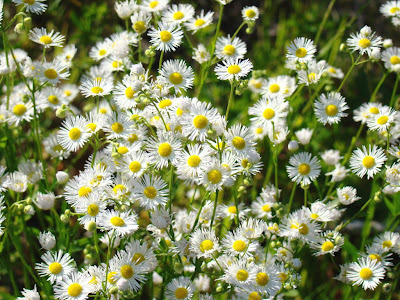 I think this is Philadelphia fleabane, also known as Philadelphia daisy and sometimes also daisy fleabane. All are from the aster family, and many species are similar enough that differentiating among then is challenging. Just when I think I’ve got it, another similar species makes me wonder. This patch was particularly thick with flowers yesterday afternoon, basking in the warm sunshine. The individual flowers are about half an inch across or perhaps a bit larger, and the plants are 2-3 feet tall. Yesterday afternoon the patch was alive with honey bees, a welcome sight. Before colony collapse disorder was in the news, I can’t say that I paid much attention to the number of bees around, so I can’t be sure what a ‘normal’ number of bees should be. That said, my impression is that I have a decent number of bees around this year, so I think at least the very local population of them is doing okay. Here on Roundtop, the forest is starting to look a bit dry. It’s been nearly two weeks since any rain has fallen, after weeks of near-daily rains in June. Rain is predicted for tomorrow, so the dryness won’t last much longer. It’s interesting to me how little time it takes for a soaked forest to dry up, but that’s what’s happened. Wouldn’t you think that nearly 10 inches of June rain would keep things moist for longer than two weeks? Guess not. When will it ever end? I’m starting to think there are few truly native plants around. 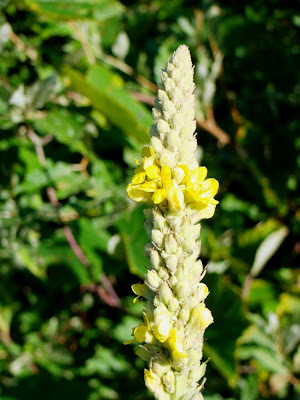 Today’s photo is of the mullein, a common wild plant with many medicinal uses and cool common names. But, as I seem to discover All The Time, it is not a native plant. Does that surprise you? It sure as heck surprised me, and I’m getting tired of it. I’m starting to wonder just what this landscape around here might have looked like before all these non-native plants were released. And those non-native plants are so sneaky, too. They are very good at finding a foothold and pretending they have always been here. Take the mullein for instance. It’s got a whole host of common names that make it sound as though it has always been around—Quaker Rouge, for one. The Pennsylvania Dutch call it Wolla or Wolla Graut (they smoke it). Native Americans used it regularly, usually for congestion, which brings me to one of its most common names—lungwort. Supposedly, one way to use the plant is to take its fresh leaves, pour boiling water over them and then inhale the infusion. I think I’ll give that one a try myself, perhaps tonight. I’ll let you know how it goes. Of the plant’s many common names, my personal favorite is My Lady’s Flannel. Flannels were an older name for wash cloths and refers to the soft, velvety leaves of the plant. So I think I’m going to make a mid-year resolution. I hereby resolve that I’m no longer going to post photos of non-native wild plants anymore. Gee, I hope that doesn’t mean I’ll have to give up posting photos. Stay tuned. The forest around me is already beginning to take on the look of mid-summer. That surprises me a little. For one thing, the season is only two weeks old. For another, this region has not yet had a 90-degree day this year (Note: I am not complaining about this at all. I’m just mentioning it because it’s highly unusual). So I wouldn’t have expected the woods to be taking on that vaguely dull shade of green, nor for the wild grains at the forest edges to have ripened to shades of brown just yet. But both those things are happening. The forest has entered the time of year where growth and change slows down dramatically. It’s not really a static time—no time is in the natural world—but it feels pretty close to that. After the blinding speed of spring’s explosion, any slowdown is going to feel very slow, much slower than it actually is. In any event, that point of slowdown, both the perception of it and the reality, is here. Ideally, I should be a little like the forest and slow down myself. In spring, a morning of not paying attention or a day lost to rain can mean I might not see something for another full year. Not now. Whatever it is will still be there tomorrow. But the habit of running around is hard to break, at least for me. Sitting still? What’s that? Sometimes it feels as though sitting still for five minutes means 20 other things won’t get done. Eventually, usually, I am able to down shift my gears, occasionally. Hasn’t happened yet. I’m still working on it. Maybe a 90-degree day would help. Inside, a cabin in the woods is still inside. A view of the forest without is not the same as being in the forest. 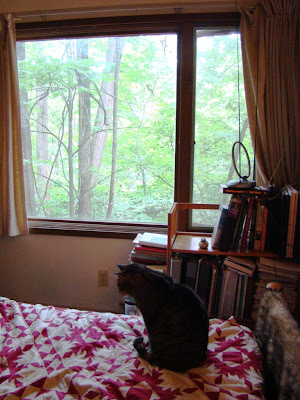 All windows open, tantalized by birdsong. Earthy aromas sneak inside like winter mice. The distance four thin walls creates is vast. Stormy evenings are the rule in this area during summer. During the day, the sky is sunny but after hours of heating, instability builds up. By dinnertime or the commute home, thunderstorms become the norm and are almost a daily occurrence. Last evening was no exception, though the storms held off until nearly dusk. The sky had a threatening look from late afternoon on, growing ever more threatening through dinner and the early evening dog run. By 8:15, the sky looked like night, and at this time of the year, the sun should still be shining. I grabbed the dogs and announced it was time for their final run of the day. The time was much earlier than their usual last trip outdoors. Dog, who is the smart one and who hates thunderstorms, understood my urgency, I think. At least he was eager and complied quickly. Baby Dog, who is not the smart one, fiddled around smelling dirt and chewing leaves as the thunder grew ever closer and the rain began. She was oblivious to the coming storm, or at least oblivious to the need to get back inside the cabin before the next bolt of lightning struck even closer than the last one. Finally, exasperated with her fooling around, I yelled at her, "I’m going to give you a bath if you don’t hurry up!" Baby Dog hates water, won’t walk through puddles and seems to think her toes were not meant to ever be wet. The threat of a bath did it. She performed her duty, and we made it back inside—just as the next bolt of lightning knocked out power for the next hour. I’m going to have to remember that threat and hope it works on her the next time. Summertime is here this week. I can see it in the color of the green forest around me. In spring, the foliage starts as a bright, almost eye-popping green. But now, it’s settled in as a green that’s just a bit less dramatic. The dull green of August is still some time away, and today and for weeks yet to come the green will be the pretty, deep shade of summer. Here, the weather has been far cooler than usual. Not a single day hit 90 in June, though one or two came close. I’m sure I’ll pay for that later in the season, but today I’m not complaining. If summers stayed in the 70-80 degree range, I wouldn’t mind them at all. Perhaps because of the cooler temperatures, the season is different from other summers in other ways, too. Fireflies look less common to me. Oh, they are there, but the little twinklers are fewer than I recall. The wild raspberries that I so look forward to were few and far between, too. The ones I did find (and that were left over after allowing my camp kids to eat them) were certainly good and sweet, but only served to whet my appetite for more. Each season has its slight differences from average. These are the ones I’ve noticed for this year. And that’s how it goes. One year is hotter, one cooler, one dry, the next wet. I believe that if any one weather pattern repeated itself for several years, some of these subtle differences would become the new normal. But usually it doesn’t work that way. At least it doesn’t work that way so that I can see. 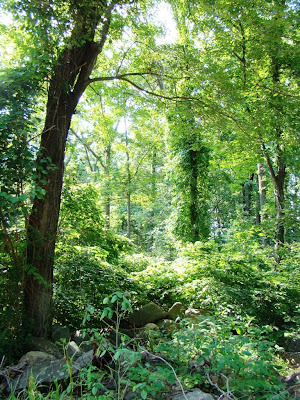 Instead, the year-to-year weather differences highlight or suppress little pieces of the greenery that go into making a forest. 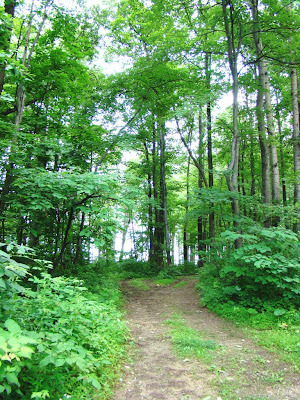 The forest is still a forest, still an eastern deciduous forest, but little pieces change from year to year. I like seeing those tiny changes around the cabin. I know that next year or the next, some other little piece of the forest will have its day, while another will not.